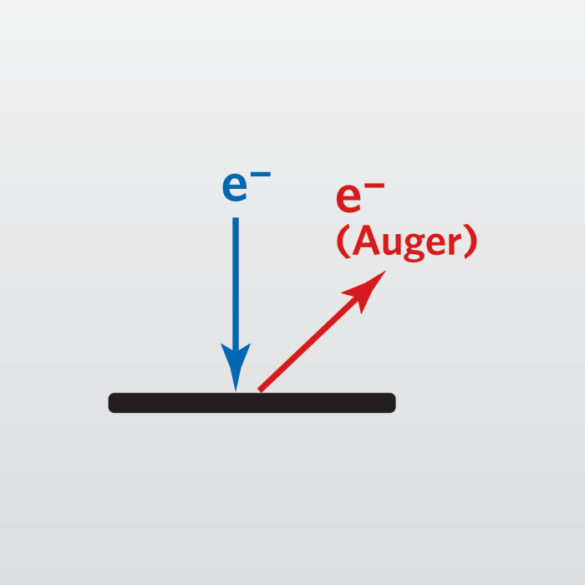 Auger Electron Spectroscopy (AES or Auger) is a surface-sensitive analytical technique that utilizes a high-energy electron beam as an excitation source. Atoms that are excited by the electron beam can subsequently relax, leading to the emission of “Auger” electrons. The kinetic energies of the emitted Auger electrons are characteristic of elements present within the top 3-10nm of the sample. The electron beam can be scanned over a variably sized area, or it can be directly focused on a specific surface feature of interest. This ability to focus the electron beam to diameters of 10-20nm makes Auger Electron Spectroscopy an extremely useful tool for elemental analysis of small surface features. When used in combination with a sputtering ion gun, Auger can also perform compositional depth profiling. EAG has unmatched experience handling both routine and non-routine Auger analysis requests and for many years, has used Auger to address a wide variety of industrial analytical applications. EAG’s extensive Auger expertise has direct analytical benefits, whether we analyze sub-μm particles to determine contamination sources in wafer processing equipment or analyze defects in electronic devices to investigate the root cause of failures. Auger analysis has extensive applications in metallurgical studies, including in the determination of oxide layer thickness of electro-polished medical devices, and EAG continually draws on its experience to help solve demanding problems from customers from many industry sectors.